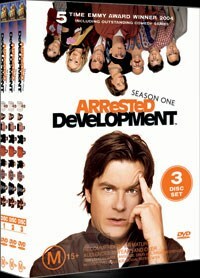 Level-headed son Michael Bluth takes over family affairs after his father is imprisoned. But the rest of his spoiled, dysfunctional family are making his job unbearable. This clever, original, and all-out-hilarious comedy series from Ron Howard is critically acclaimed as the best comedy on TV. Arrested Development is a brilliant and underrated series that is unfortunately being screened by local television stations in Australia at a late time slot. The series revolves around a dysfunctional aristocratic family of America who happen to run a powerful company. Unfortunately when Michael's father is imprisoned, he has been given the job of keeping not only the business afloat but also the family. Each episode features one of the whacky family members of the Bluth family and how they get into or get out of trouble which makes for some extremely witty television. Great stuff and a plethora of special features that fans will simply adore! The series has an all-star cast that include Jason Bateman, Portia de Rossi, Will Arnett, Michael Cera, Alia Shawkat, Tony Hale, David Cross, Jeffrey Tambor, Jessica Walter, Clint Howard, Liza Minnelli, Judy Greer, Bob Odenkirk, Henry Winkler, Patricia Velasquez, Carl Weathers, Amy Poehler and Seinfeld's very own Julia Louis-Dreyfus. TV Land Featurette and more!